In late December whilst the nation’s attention was transfixed on Brexit and preparations for Christmas, the Government deviously proposed to radically change the way it funds councils (hoping that the rest of us would not notice). The Government has refused to listen to councils and councillors from across the country and from all political parties, and none, who are saying that enough is enough. Instead of heeding the advice of hard-working councils and their staff who are struggling to deliver the most basic of services for our communities, they have instead focused their attention on introducing a new funding model which, to no-one’s surprise, predominantly benefits more affluent Tory areas. This pathetic attempt at a ‘fair funding’ review is purely political and will mean only one thing: more funding will be taken from the poorest parts of England and given to more affluent (conveniently Tory) councils in a perverse ‘reverse redistribution’. Facts are facts. Tory cuts to local government of over £16 billion since 2010 mean councils have lost 60p out of every £1 that the last Labour Government was spending on local government. Councils now face a further funding gap of around £8 billion by 2025 just to keep services ‘standing still’ and meeting additional demand. Local authorities’ spending power per household is on course to fall by an average of 23% (£243) between 2010-11 and 2019-20. But Labour councils are set to see falls of 28% on average, compared to a 19% fall for Tory councils. Sadly, the impact is being felt here in Tameside as well. 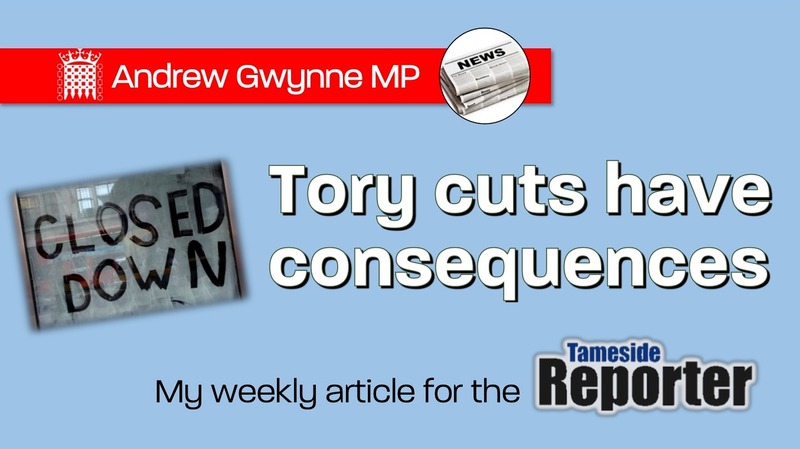 Tameside Council’s spending power will be £543.56 lower per household next year than it was in 2010 – that is just outrageous. How can our hard working council staff expect to keep our green spaces clean, our roads well maintained and ensure our the most vulnerable in our society are well looked after. The sad truth is that as time goes on councils are finding it increasingly difficult to offer the most basic of services to their communities for no other reason than ideological cuts to council budgets from this Government. We have already seen what can happen with this slash and burn strategy towards local services. Last year, the people of Northamptonshire sat back and watched in horror as their cash-strapped council essentially filled for insolvency. I know for a fact of the herculean efforts of councils and councillors across the country who day in and day out work tirelessly to ensure our communities remain safe, with little or no support from central Government. Added to this police budgets have been slashed by £2.7 billion in real terms between 2010-18. Locally, Greater Manchester Police Force has seen a net loss of £153,765,745 in their budget over the same period. These budget cuts have decimated our frontline police officers in Greater Manchester, plunging by close to 2,000 officers in just eight-years. It’s not surprising then that so many residents feel less safe now than in the past. This perfect storm of cuts cannot continue. Our most deprived communities and most vulnerable citizens are at risk; rather than the smoke and mirrors offered by this Tory Government, our communities need support, and they need it now.